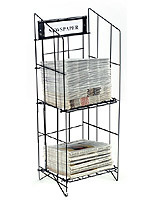 These Newspaper Racks that are Designed to Knock Down Feature a Portable Design! 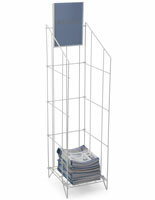 Use the Merchandising Stands in Any Sales Setting! These Newspaper Racks are Equipped with Sign Holders! 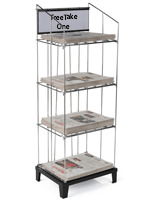 These affordable newspaper racks feature simple yet fully functional design. The stands are made from heavy duty wire for durability. 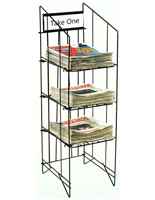 The newspaper racks also have a gloss black powder coated finish that blends in anywhere. Each unit has three shelf tiers, which are ideal for showcasing three different publishers at the same time. 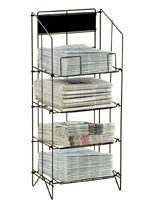 These newspaper racks are commonly utilized in supermarkets, drug stores, and convenience stores. 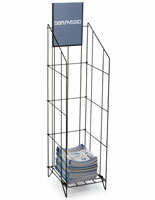 The newsstand accessories are designed for maximum exposure and stand at 43" high. 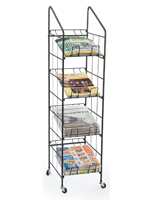 This way, the newspaper racks are always easily accessible to customers. 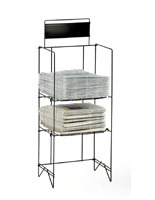 The display stands will fit 15-1/2"w broad-sheet periodicals, such as the Los Angeles Times. The newspaper racks also feature channeled sign holders at the top that allow merchandisers to insert their own custom printed message. The 14" wide by 4-1/4" high dimensions are perfect for capturing the attention of customers.